Exhibit 1: Eye makeup never helped anyone write better. Exhibit 2: Sabbatical sweater. Hood keeps the ideas from falling out. Exhibit 3: No, really, it’s still me! Gosh! You look nice! Everyone said. I did look nice, comparitively, and it’s the comparisons that have got me thinking today. People, in general, treat me a lot nicer when I look like Exhibit 3 than Exhibits 1 and 2. A lot nicer. On campus, when I’m well dressed, people assume I’m a faculty member. Staff do not glance at me askance, but rather, expectantly. Professors I don’t know banter with me, or respond happily to my unprovoked friendliness. When I’m not so well dressed, people I know walk right past me, and look right through me. People I don’t know give me static: everything seems a little … bit … harder. They don’t smile at me as much, they seem a little suspicious. 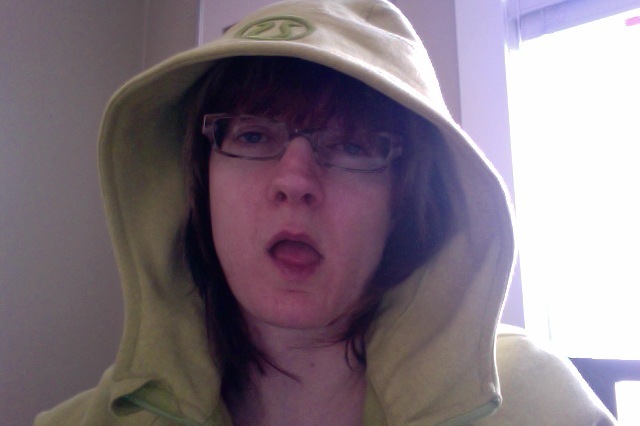 I wonder: is it because the no-makeup-all-hoodie look disguises my insitutional positioning? I am possibly an aged graduate student, or maybe a staff member who works so far back in a back office there is no dress code? Who am I? Or is it simply that I don’t look attractive? Off campus, when I’m well dressed, I get free stuff. Really. Like a break on a taxi fare, a free pastry at the coffee shop. The bus stops pulling away from the stop, and lets me on. The clerks at the drug store are actively friendly. These things are not true when I’m in my ratty jeans with pouffy hair and pale lips. Maybe when I’m well dressed I look like I have money, or like I’m competent. Or maybe when I’m not well dressed I look like a middle-aged woman, and they’re not worth much attention or kindness. But it’s striking, the difference. I can switch my ‘look’ (such as it is) from day to day, and the differences in my experience of the social world are profound and discomfiting. On the one hand, it’s good, I guess, that I can smooth my own damn path in the world simply by brushing my hair and wearing pants with a zipper. On the other hand, that’s kind of offensive. I mean, I like to cute as much as the next professor, but it seems rude that people treat me less well when I’m in my Super Productive Magic Writing Outfit. Then again, it seems rude that people give me free stuff when I put on lipstick. So. “Good looking” is a complicated thing, and how I look alters how the world and I interact, shifts my potential for action in the world. I can be ambivalent about it, but it’s true. I am ambivalent about it. And if I’m perfectly honest, I’m a little worried that the option to “dress for success” gets a little harder to access year by year, as I move from young woman to middle-aged woman. Maybe that will be freeing. I’m not sure. I’m looking for a day when I can wear my hoodie, and get my free donut, too. Previous Post Guest post: The Power of Procrastination! Dress decently, look like there's a difference in your world between “public” and “private,” and make the best of what ensues. My simple philosophy, anyway, and I'm very contented with the results. Oh, in my world, this also goes for dudes. Yes, I probably _will_ pay a bit more respectful attention to a guy in a suit than one with his jeans hanging halfway down his arse, his anorak/puffa/whateverit'scalled six sizes too big, and a baseball cap on his head. And I'm fine with that difference, myself. The butchy queer end of the spectrum makes this more difficult. My male colleagues do not have to dress up as much as I do to get the same amount of respect, I have noticed. But even when I'm in a suit, the dyke look means that I do most certainly not get free stuff. I get mistaken for a man, but I don't get the respect a man gets. I'm also over 45, which means that I am invisible anyway (see Jo-Ann Wallace's post on this blog). Do I care? Not really. In academia, if you look too corporate, that is bad. If you look like a slob you are either a) a theorist/genius or b) strange. Too many rules, I say. I just dress up for teaching and leave it at that. You look lovely my friend. And I miss you. I'd miss you even if you were wearing a hoodie with no makeup. I like dressing down to “pass” as a student (aged, now) sometimes. I think the really disconcerting thing is knowing that you know how to access the power behind an old maxim my grandmother taught me: “good clothes open doors.” Knowing how to do it and having the wherewithal to do it are extraordinary advantages that not everyone has. @Dr. Identity: Ah yes, the “butchy queer” look precedes you in the world when it happens to be the way you present yourself, or its the way you self presents you. I have a normative body and sexuality, which trails behind it quite different concerns around positioning. The point remains in either case that a) it's always harder for women, and b) how you look always matters to how people understand you. BAM! You have nailed it right on the head. That's exactly what I was thinking of: that this set of cultural scripts is manipulable, and by me, is a huge advantage to me. So even if I don't think it's a fair way to judge people, I can totally work it to my advantage. For now, anyways. Creepy. I am working on finding a good balance between dressed up and scholarly grad student shabby chic. If I dress too nicely I get the wrong kind of attention, and a lot of it. If I dress like a slob people think I am sick and they either fuss over me or treat me poorly (going into a nice women's apparel store with make up and nice clothes vs no make up and sweat pants). It can be hard to be taken seriously when young, a woman, and focused on your appearance, and it can be hard to be taken seriously when you are any age, a woman, and not focused on your appearance. That's why I have my collection of knit skirts, pencil skirts, blouses, and sweater vests. I'm dressed, I have make up on, but I look like a nerd. It does often seem like there's some kind of tiny little sweet spot somewhere in between two unattractive (if you will) options: but it's hard to find that spot and harder to stand in it long enough to feel comfortable. Good for you for working out what works for you!